The American honeysuckle is a low-maintenance climbing vine that produces fragrant flowers. These plant is found mostly throughout the Eastern coast of the U.S. According to the United States Department of Agriculture, many of the species of American honeysuckle, such as the American fly-honeysuckle, are endangered. The American honeysuckle is also called the Lonicera Americana. This plant is a climbing vine that is often grown for the flowers it produces. It has deep green leaves in an oval shape. The flowers produced by the American honeysuckle are yellow with a flushed red-purple. In addition to the beauty of the honeysuckle flowers, the American honeysuckle is also popular because of how easy this plant is to grow, according to backyardgardener.com. This flower is able to survive deer, rabbits, heat, humidity, slopes, seashores and wind. While fertilizing is not necessary, the American honeysuckle will be healthier and bloom more if it is fertilized. 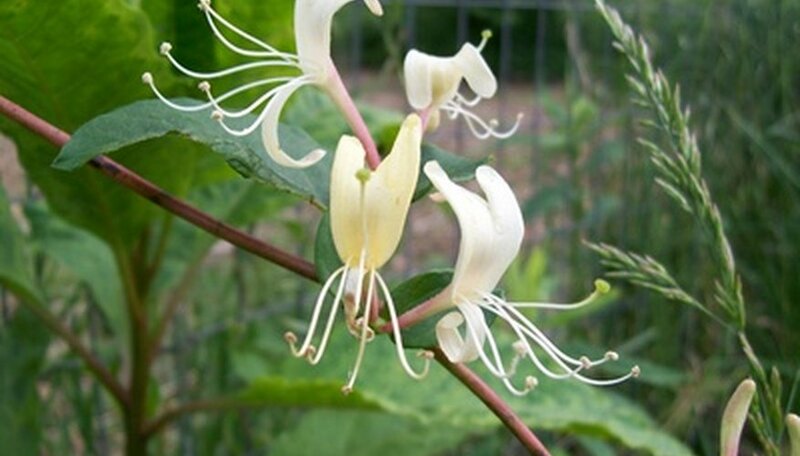 According to abnativeplants.com, one breed of American honeysuckle, the trumpet honeysuckle, is a food source for hummingbirds. This plant remains evergreen in areas that are warm, but is deciduous in areas that get colder. These plants like both soil that is sandy and soil that has lots of clay. They can survive in partially shady areas, though they won’t produce as many flowers; they need at least six hours of sun. The American honeysuckle likes a lot of nitrogen in the soil, though too much nitrogen can reduce the amount of flowers produced and cause the honeysuckle to produce much more foliage. The soil needs to stay adequately moist, requiring many gardeners to water the soil very deeply once a week. Since these plants like to climb, they should not be planted near walls because they will climb up the wall, climbing away from the water. American honeysuckle begins to bloom in May and can continue until late fall, backyardgardener.com notes. Fertilizer should not be applied late in the season because that will reduce the amount of flowers that are produced. The American honeysuckle is susceptible to aphids and scale insects. Aphids will cause the honeysuckle to grow deformed leaves and buds. Scale bugs cause yellowing leaves and leaf drop. Aphids can be eliminated by washing the leaves of the honeysuckle and by introducing ladybugs, which prey on aphids. Scale insects are difficult to get rid of, but parasitic wasps prey on scale insects. American honeysuckle can also develop powdery mildew and leaf spots. Fungicides can kill powdery mildew; prevent this fungus by giving the honeysuckle adequate sunlight and circulation. Leaf spots can be eliminated by removing the infected leaves and by not splashing water on the leaves.